Western Red Cedar is beautiful and naturally withstands the elements! We have very unique and functional cedar furniutre, as well as a variety of pieces in pine. Some pieces include green accents to complement the tones of the natural wood. Whether you're looking for a planter, potting table, or bench to add to your outdoor seating, you'll find a variety of choices in our cedar line! 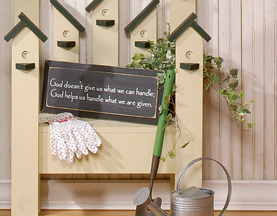 Our Birdhouse Planter Bench is truly unique with darling little roofs! Use this garden furniture inside or out. Decorate your porch! Our solid wood totes also make great planters! Plop in a potted plant or flowers and you're done!